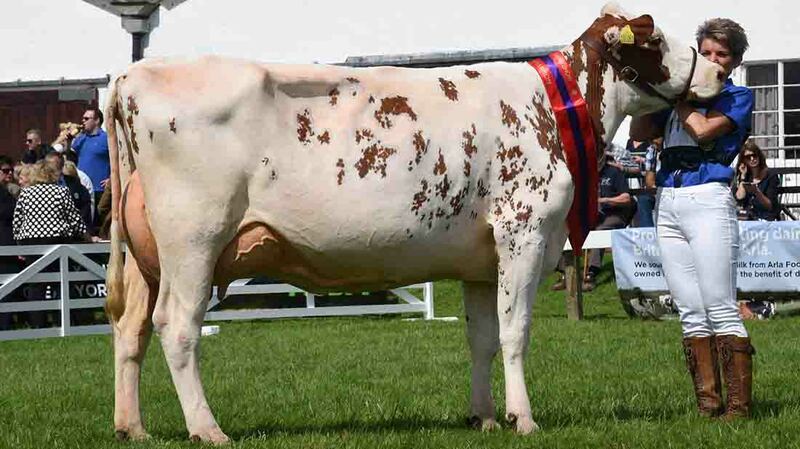 A Dairy Shorthorn took home the dairy inter-breed title at the Great Yorkshire Show. Dairy Shorthorn third-calver Churchroyd Peggy 19, from I.R.G. Collins and Partners, Dewsbury, took the inter-breed supreme after taking the breed championship at the show for the third time in a row. It was also breed and inter-breed champion at Royal Cheshire for the third time, the stage for the National Shorthorn Show this year. Classified EX91, the five-year-old home-bred cow is giving 55kg a day at 4 per cent butterfat and 3.4 per cent protein after calving in May. Judge Simon Thomas, Llanfyrnach, Pembrokeshire, described it as a tremendous example of a Shorthorn cow, with an excellent top line and spring and depth of rib, with a ‘mammary system which excelled the cow’s capacity’. Reserve inter-breed and champion Holstein, Newbirks Jazz 1584, from Robert and Elaine Butterfield, Lancaster, Lancashire. 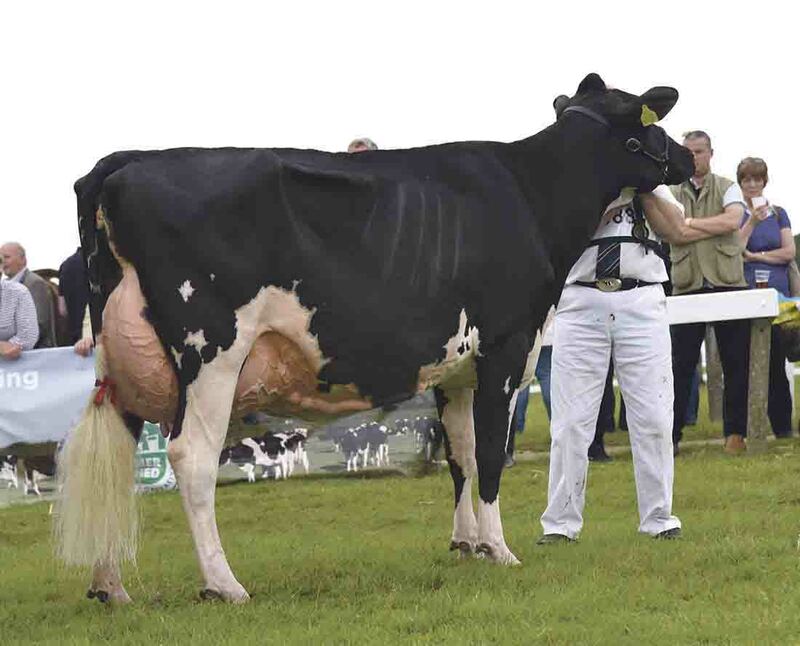 Reserve in the dairy inter-breed was the Holstein champion Newbirks Jazz 1584, which was put forward into the championship after the original champion, Peak Goldwyn Rhapsody, from Y.K. Bradbury, Buxton, was disqualified after an incident of teat tampering which breached the show’s regulations. Newbirks Jazz 1584 is a Comestar Lavenguard daughter out of Newbirks Jazz 1497, from Robert and Elaine Butterfield, Lancaster. The third-calver was bought as a milking heifer from the Lawsons’ Newbirks herd last year. It calved in December and is giving 40kg/day at 4.32 per cent butterfat and 3.41 per cent protein. Jersey champion, Kempbrook Tequila Jillian, from the Richardson family, Doncaster, South Yorkshire. 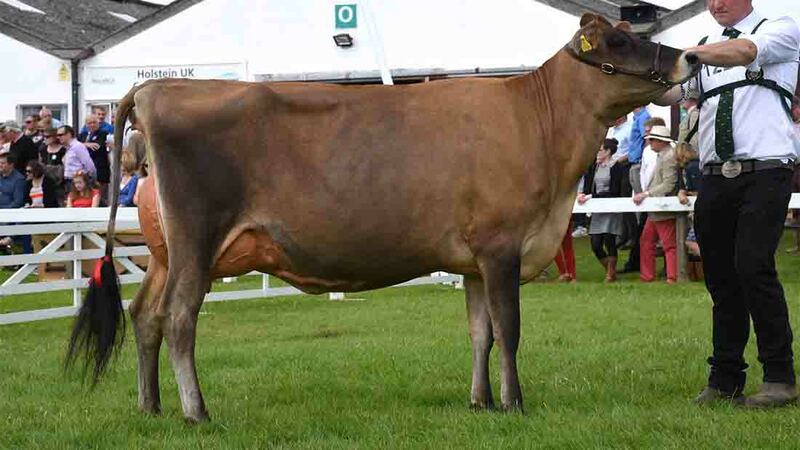 Inter-breed champion at Otley Show last year, it was third in its class at the Great Yorkshire last year as a calved heifer and was second in its class at the recent European championships. Mr Thomas said the four-year-old cow was ‘very correct’ to the breed, with a ‘super mammary system’. The Jersey champion from the Richardson family, Doncaster, was Kempbrook Tequila Jillian. Born September 2013, it calved for the first time in March and won best udder in its class. It is giving 26kg/day at 6.2 per cent butterfat and 4.2 per cent protein. 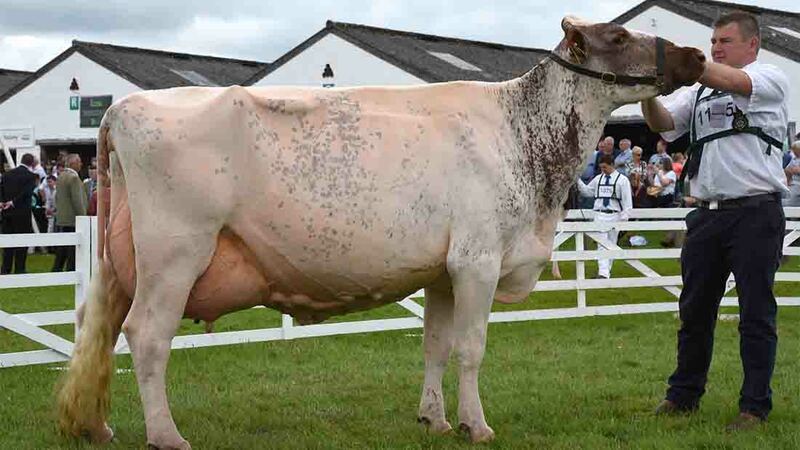 Ayrshire champion, Sanderson Break Ester 493, from D. and C. Sanderson, Wigton, Cumbria. Champion Ayrshire was the home-bred cow Sanderson Break Ester 493 from D. and C. Sanderson, Wigton, sired by Sanderson Breakaway and classified VG88. Born August 2011, the third-calver is giving 38kg/day at 3.4 per cent protein and 3.7 per cent butterfat. Out for the first time this year, it came third in its class at the Great Yorkshire last year and will now be shown at Cockermouth and Westmorland Shows. Inter-breed (Judge, S.V.B. Thomas, Llanfyrnach) Supreme, I.R.G. Collins and Partners, Churchroyd Peggy 19 (Dairy Shorthorn); reserve, R. and E. Butterfield, Newbirks Jazz 1584 (Holstein). Holstein (K. Wilson, Carlisle) Sup., R. and E. Butterfield, Newbirks Jazz 1584; no reserve. Dairy Shorthorn (R. Morgan, Whitchurch) Sup., I.R.G. Collins and Partners, Churchroyd Peggy 19; res., G.G. Baynes and Son, Marleycote Songstress 20. Ester; res., G.G. Baynes and Son, Marleycote Sea Lily 21. Jersey (S. Bland, Penrith) Sup., Richardson family, Kempbrook Tequila Jillian; res., M and D. Wilson, Hailstone Excitation Winsome 2.